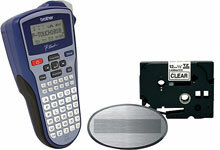 The Brother PT-1010NB has been discontinued. No direct replacement is available. Easily create professional-looking badges quickly, without the hassle or wait. Simply type and print the employee's name using the included PT-1010NB labeler and adhere the label to one of the included metal name badge blanks. 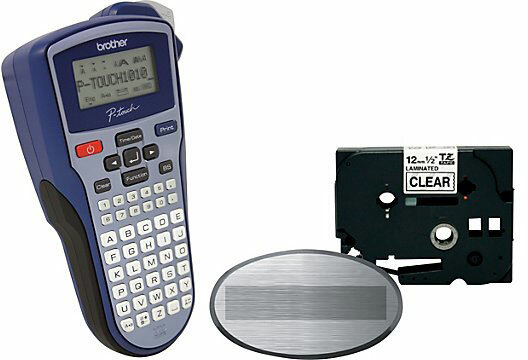 The portable, handheld PT-1010NB labeler with rubber grip offers a wide selection of features, including: 2 line printing, large 12-character LCD display, 8 type styles and 3 type sizes. Create personalized name badges with 6 frame options, 6 built-in auto formats and up to 83 symbols. Easily re-use badges by peeling off the name label and replacing with a new employee name. Great for retailers, food service and hospitality industries. Includes handheld labeler, 10 name badge blanks, black on clear "TZ" laminated tape, 10 magnetic badge backings and 10 safety pin backings. Additional name badge blanks also available.